The saw blade swivels - the workpiece does not turn. 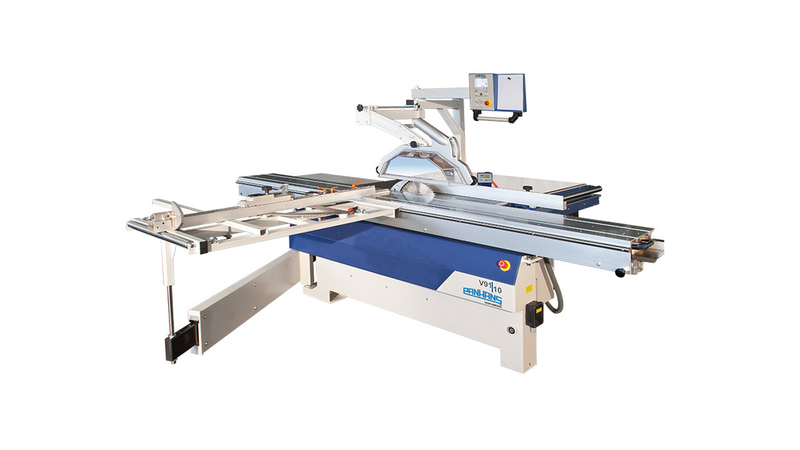 When working with the panel rip and cross cut saw V91|10, the user does not have to adapt to the workpiee as this is taken care of by the machine. The solid construction and the powerful motor emphasize once more the competence of the label PANHANS in the are of dimensioning saws. The cutting height in the 0°-position of the saw blade (90°) is 172.5 mm and even in the 45.5°, cutting heights of 90/120 mm are possible. The slewing range is +/- 45.5°. Staircase joints in the shifter cut can thus be processed smoothly, additional devices might be necessary in exceptional cases. The panel rip and crosscut saw V91|10 is predestined for a comfortable and efficient operation due to its characteristics. For the V91|10 is a wide range of options and accessories possible e. g. a controlled rip fence and a perfect mitre-length compensation (Super-Gehrfix).